One of the best bits about travelling for Jonathan and me is sampling the local dishes in the places we visit. On our recent visit to Oporto in the north of Portugal, we were recommended to try the local speciality of the area, the ‘Francesinha.’ We had tried it before and were underwhelmed, but since everyone in Porto raves about this sandwich, we thought we would give it another go. 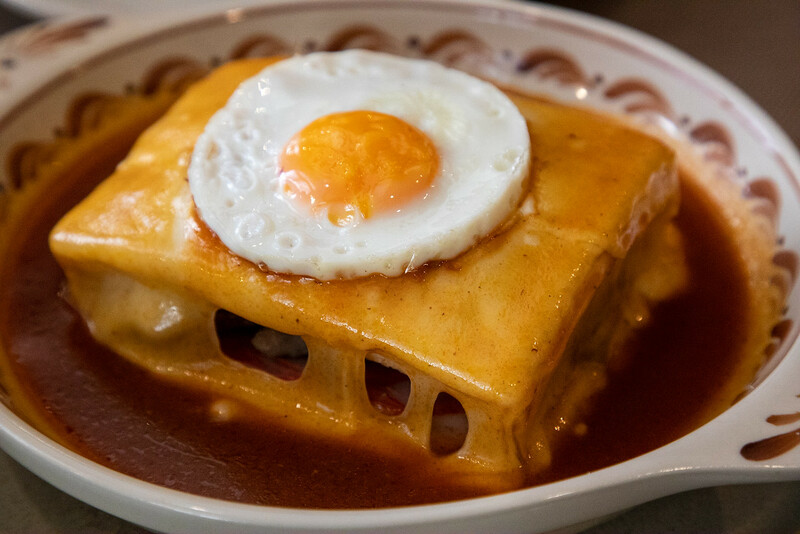 So what exactly is the Francesinha? Well, the name means Little Frenchie or Little French Lady, and apparently, this dish was inspired by the French Croque Monsieur, a toasted cheese and ham sandwich, and adapted for the Portuguese palates. It is made with bread, a lot of meat – ham, steak, sausage, covered with melted cheese, served in usually a thick tomato and beer sauce with French fries on the side. How to make the recipes for Francesinha sauce is a secret, with each restaurant having its own variation. Beer is the only common ingredient. Most Francesinha sauces are tomato based, though not all, and vary in their degree of spiciness. Our sandwich was quite tomatoey but not so spicy. Maybe spicy would make it better? The colour of the sauce ranges from different shades of red to orange. It seems that everyone in Oporto has an opinion about where to find the best Francesinha. The owners of our guest house Sao Luis said for the best Francesinha in Porto we should forget about the cheaper places and go straight to Brasão Restaurant. There are two branches of this popular restaurant, and we arrived just in time before the lunchtime queues started. The Brasão restaurant also offers a vegetarian version of the dish – not sure how as meat is such a major ingredient of the Francesinha, but it seems that they substitute tofu, spinach and mushrooms. Who knows, that might make it better. So what did we think of Oporto’s most famous dish? 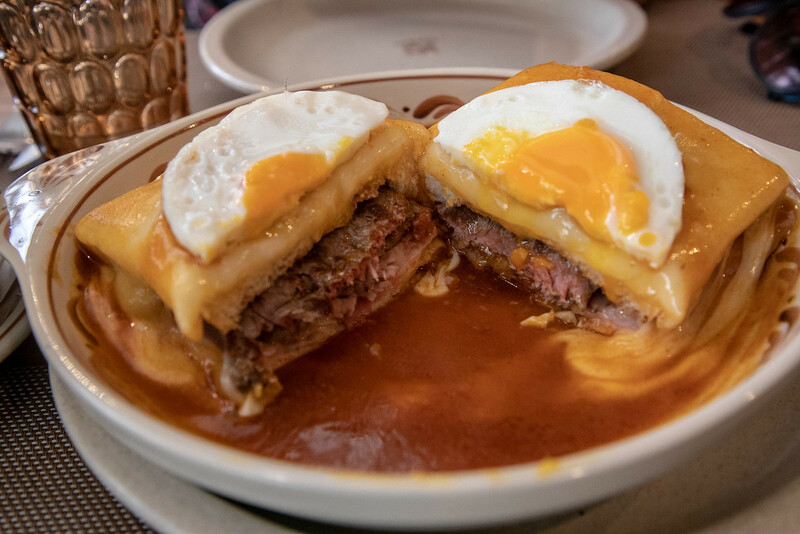 Ah well, at least now, we can say we tried the best Francesinha in Porto but to be honest, if I had to choose between a Francesinha or a Croque Monsieur – well our vote would be (drum roll!) – the Croque Monsieur!